With the invasion of the Waikato by the British in 1863/64 Cambridge and districts were cut up to provide farms for the soldiers of the 3rd Waikato Militia. Under the Chief Surveyor, Charles Heaphy, there were at least ten surveyors in the field around Cambridge. The Cambridge township was surveyed first so the Militia men and their families could be settled. Shepperd and McDonald surveyed the Hautapu Parish, north of Cambridge and on 5 January 1865 the men drew their land from a ballot. Most of the area was swamp. William Thorne Buckland started buying up their scripts to add to his large lease holdings. He paid from £5 to £25 a section. Later John Williamson and Thomas Russell were buying up the land for approximately £100 a section and they formed the Auckland Agricultural Co with MacLean & Co. Money from England was invested and the Bank of New Zealand held the mortgages. The manager, Thomas Every MacLean took up permanent residence at Fen Court in 1874. Interested in bloodstock the company imported many stud Hereford and Shorthorn cattle, Clydsedale horses and Leicester and Down sheep. MacLean was also interested in the NZ Stud and Pedigree Stock Co, the Auckland Agricultural Association and was a foundation member of the Waikato Farmers’ Club in Cambridge, where farmers met to discuss drainage, fencing, crop growing, manures, tree planting; to show their accomplishments and compete for trophies. It wasn’t long before many acres of swamp were drained and surface sowing among the tree stumps was started. In 1879 the English periodical ‘The Field’ stated that MacLean & Co were probably the world’s largest stud breeders. Their purebred Hereford herd alone numbered over 300 head. The Shorthorn stud, led by the famous sires Duke of Cambridge and Duke of Newcastle, was described in Sydney journals as ‘amongst the world’s best’. 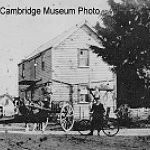 By 1880 his sheep tally was 1828 and the Waikato Times stated – ‘His employment of local farmers in roadmaking to the property and other intitial work gave a valuable stimulous to the economy of the Cambridge settlers. MacLean employed many Maori contractors whose tents and smoking fires could be plainly seen in the foothills from the township’. In 1882 Memories of Travel and Sport by Bullock-Webster, records that – ‘Fencourt was a delightful station to stay at – so pretty and homelike. Every MacLean was a lover of flowers, and the gardens were a mass of bloom; the kitchen garden was one of the best I ever saw; strawberries galore, melons, kumaras and everything else that the heart of a cook would rejoice in; and the big orchard was stocked with every fruit that grew: apples with no codlin moth, nectarines, plums of all kinds, apricots and greengages, all healthy and well, no pests worrying them as they do nowadays. What feeds we had when we came in thirsty and tired after a hard day’s riding. The swamp was found to be caused by the stoppage and choking of the river that flows through the Estate. The land at one time must have been covered with fine timber, which was destroyed by fire. Eventually, when the roots were sufficiently decayed, they fell into and across the river bed, causing the obstruction which created the swamp. The river beds were cleared and the trees and native eel weirs removed. The land became dry and the banks suitable to grow the finest grasses. At this time the Fen Court Estate ran the Clydsedale Stud consisting of 16 imported mares and four entire horses and their increase, six of the mares and one of the horses being prize winners in Scotland. Also about 60 draught brood mares were on the estate bringing the total to about 200 horses. Over 100 men were employed in fencing and other agricultural activities over the MacLean & Co’s estates. By the late 1880s Maclean & Co were well known as gentlemen of progress who spared neither trouble nor money to improve their properties and the results of judicious and vigorous agricultural labour were seen to advantage. The estate was subdivided into convenient sized paddocks, all well stocked with cattle and sheep and like many other large properties in the Waikato at that time, was on the market. In 1893 a correspondent for the NZ Herald, while travelling through the Waikato recorded seeing a Maori eel pot which was found in the swamp while cutting a drain at the back of the Fen Court estate. The remains of a canoe, paddles, carved barge boards and eel pots were found near the remains of an ancient Maori pa 15 feet below the original surface and 2 feet under a layer of peat. There were six pots, in excellent condition found superimposed under each other. The Maori of the time knew nothing of the previous history of the site and the pots were smaller than they were accustomed to using. Their theory was that a creek formerly flowed down the valley from Maungakawa and that the pa must have been an outpost to protect the settlements and cultivations on the range. In 1896 a drain, 4 feet x 4 feet, had been dug to drain much of the swamp and had dried up a lake in the upper valley where Mr Thornton of Maungakawa had kept a boat for duck shooting. It was deepened to 10 feet and widened to 12 feet. The drain ran along side the valley road for 1½ miles from Te Miro and took the place of the natural water course. A problem around Fen Court was that the creeks silted up land on either side of the water course so that the level of the water was higher than the surrounding land. This made it very difficult to construct drains in the natural water courses. With the depression of the 1880s and 90’s many large estates failed. Much money had been borrowed and to restore the banks’ soundness the Estates’ Company was separated from the Bank and the NZ freeholds, leasehold stations, stock and implements were disposed of to an Assets Realisation Board. Fen Court was bought from the BNZ (for £4 10/- an acre) by the Government in 1898 and William Main put on as manager. By the end of 1899 the estate had been surveyed into 41 small farms and a clearing sale of 1,000 sheep and 1,000 head of cattle as well as numerous horses was held on 21 February 1900 by Nicol & Co.
Every Maclean died 12 August 1901. Fen Court Estate became the district of Fencourt.